As part of the Designation of Origin’s communication plan, Rioja continues to put an emphasis on promoting the region’s white wines, whose sales grew once again in 2017, by 16%. On 24 and 25 April, the Control Board welcomed 24 opinion leaders from the specialist Spanish press to a tasting session of more than 220 white Rioja wines. A total of 25 wines were selected as ‘outstanding’ among the broad representation of participating wineries. As part of the DOCa Rioja Control Board’s promotional plan, the organisation continued to focus its efforts on highlighting the region’s white wines. The essential objective of this campaign is to continue supporting their development, something the Board has been engaged in for the past three years, after studying their positive performance in trading results (up 16% in 2017, with a particularly positive performance in the international market, in which growth reached 25%). Single varietal white wines made from native grape varieties. White wines made from blends of native grape varieties. White wines made from non-native grape varieties (single varietals or blends). White wines aged in oak from the 2016-2017 vintages. The general impression conveyed by the tasters was positive, highlighting in particular the wines whose properties have been enhanced by their time in oak barrels and the trend towards opting for native grapes with plenty of aromatic potential, such as Maturana Blanca, Garnacha Blanca and Tempranillo Blanco, which are increasingly sought-after by consumers. The amount of land planted with these grape varieties in Rioja demonstrates that the region’s commitment to white wines is no passing fad, and that Riojan operators continue to have faith in them (there has been a 50% rise in the number of hectares planted with white varieties in Rioja, with 6,058 hectares currently under cultivation compared to 4,000 in 2015, out of a total of almost 65,000 hectares of vineyards in the Region as a whole). The good results of the region’s innovative white wine strategy have been evident since 2007, with the incorporation of new grape varieties, which has also been reflected in a considerable increase in sales volume (almost 22 million litres in 2017, compared to 16 million in 2015). 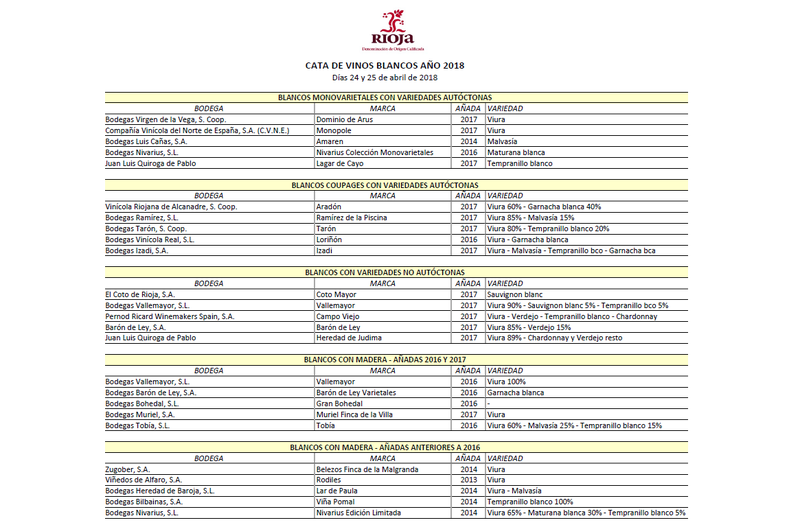 Rioja’s Strategic Plan for 2005-2020 is focusing efforts on continuing its quest for excellence, and highlights the increasingly varied offering of white wines to complement the portfolio of traditional Rioja categories. The strategy is bringing white wine lovers a real value proposition that satisfies every taste and puts an accent on the extensive experience, capacity for innovation and position of leadership held by Rioja both within and outside our borders. Blend wines, Rioja’s mainstay, are being complemented with the latest innovations in wines from new geographical indications such as viñedos singulares, village wines and regional wines, as well as the new offering of rosé wines and the quality sparkling wines to be introduced in the near future. The breadth of the current range underlines the strength-in-depth and diversity of the region. Representatives of the Control Board with a group of wine influencers who took part in the white wine tasting session organised by the Control Board. Andrés Proensa, José Ramón Peiró, Juan Fernández–Cuesta, José Luis Casado, Jaime Bermúdez, Antonio Candelas, Raúl Serrano Mar Romero, Jesús Flores, Susana Molina, María Ángeles Sánchez, Luis Garcia Torrens, Raquel Castillo, María Jesús Hernández, Antonio María Casado, Pedro García Mocholí, Salvador Manjón, Alfred Peris, Rafael Lozano, Mikel Zeberio, Alberto Gil, Enrique Calduch, Lourdes Aedo, Javier Pascual, José Luis Lapuente, Pablo Franco, Marta Echávarri, Carmen Quemada, Ricardo Aguiriano.